Wow. Just, wow. Hugeness this week. Trust me, there is epicness to discuss. Beltre and Felipe Lopez both declined arbitration, but there is still hope for the former. We all know that the A’s are offering Beltre a sweet deal, but he’s taking his equally sweet time in signing it. 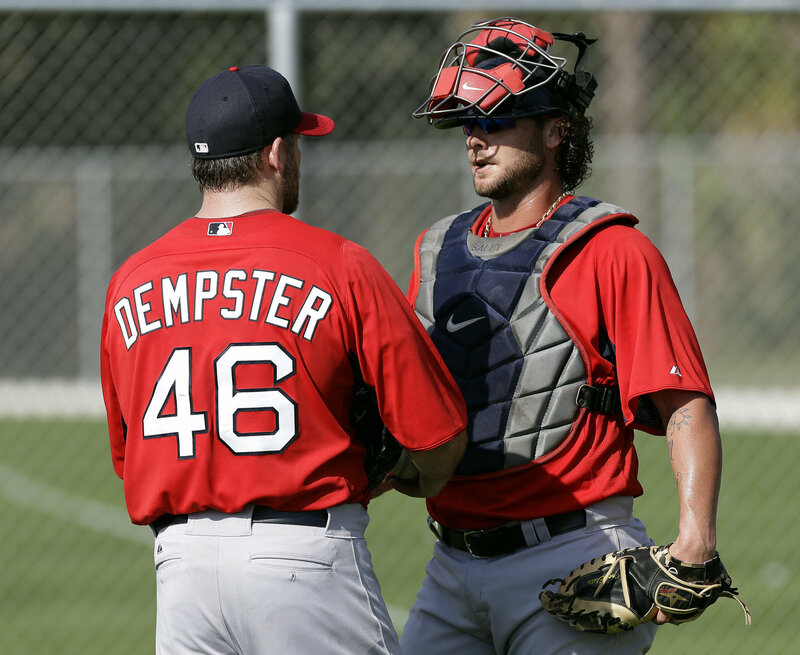 He stated publicly that he wants to return to Boston, so he’s waiting to see what Theo’s got. It turns out that what Theo’s got is a seriously awesome replacement. Adrian Gonzalez, welcome to Boston! Finally! He went to Boston yesterday for a physical to make sure his right shoulder is on track after his surgery, and he passed. We’ll be sending Anthony Rizzo, Casey Kelly, outfielder Reymond Fuentes, and a player to be named later to the Padres, which fortunately shouldn’t hurt our farm system too much because last year’s draft was so successful. Although it’ll be rough to see them all go. The important thing to keep in mind about prospects is that you never know. They could be awesome like Hanley Ramirez. Or they could be terrible like Craig Hansen. We already know what Adrian Gonzalez is capable of at the Major League level. There’s room for a contract extension; Gonzalez is entering the last year of his current deal and we already acquired permission from Major League Baseball to hammer out a new one by this afternoon. That didn’t happen, so Theo might wait to watch his shoulder in the spring, and of course there are the luxury tax implications. But he won’t be giving up all those top prospects if he weren’t assured that an extension could be worked out, which would give us stability at all three bags. Given Gonzalez’s age, anything from five to eight years can be considered feasible. We offered six, but he wanted eight. So there you go. But one thing’s for sure: celebration is indeed in order. Gonzalez will succeed in Boston. His lefty swing was practically built exclusively for Fenway Park, and he was able to excel in a quintessential pitcher’s park. Seriously. Most of his fly balls in Petco would’ve been out in Fenway. That’s why I’m convinced that he’ll get over his National League-ness in a hurry. By the way, he’s got two Gold Gloves at first. And he started almost every single game for about the last five years. Without DHing once. So here’s to you, Theo. Two years later, you finally closed the deal. And the fact that the Padres’ general manager and assistant general manager of scouting and player development both used to work with Theo is the icing on the cake that didn’t necessarily work to our advantage since they basically knew our farm system inside-out. Gonzalez will play first and replace V-Mart’s bat, we’ll move Youk to third, and Beltre, who’s older anyway, will now probably sign with the A’s. The deal is done on principle. All they need to do is announce it on Monday at Fenway and that’s it. The Adrian Gonzalez Era in Boston has begun! One more thing. Fundamentally this deal was not about New York; it’s about us, our team, our organization, and our hunger. But while we’re on the subject, I would just like to point out that, not only is Adrian Gonzalez the answer to Mark Teixeira, but we now have a young infield that’s locked and entering its prime while the Yanks have guys on the downward slope of their careers. I’m just saying. I would advise New York to be afraid. Very afraid. Tek signed a one-year deal with two million dollars plus incentives; those rumors about him going to the Dodgers couldn’t have been more wrong. They started circulating because the Dodgers had to decide whether to tender Russell Martin, who’s awesome except for injuries. We didn’t tender Okajima, given his poor performance last season, but we already tendered Paps and will be making offers to Ellsbury and Taylor Buchholz. Rumor has it that we made an offer to Mariano Rivera before he signed a two-year deal with the Yanks. The Yanks seem to be avenging this action by showing interest in Carl Crawford to drive up his price. I honestly don’t think the offer to Rivera was serious. And I honestly don’t think New York’s interest in Crawford is serious. Unless they don’t get Cliff Lee. If Lee stays in Texas, New York might seriously start looking at Crawford because they could always deal Brett Gardner for a starter. Pedroia’s foot is almost at one hundred percent. He’s been cleared to jog and will be ready for Spring Training. We have officially met with both Crawford and Werth, who, according to Dwight Evans, is the best right fielder in baseball and similar to himself. This is Dwight Evans, people. That’s seriously high praise. Not that that’s going to help anyone. Not even Werth himself. Werth is now officially out of the picture and off the deep end. He signed a deal for seven years and 126 million dollars. With the Washington Nationals. I’m not kidding. That tells me two things: one, he’s not hungry, and two, he’s essentially a fool. He’s not going to win a ring with the Nats, and seven years from now, when his contract is up, he won’t be starter material, which is obviously something that the Nationals don’t care about. So his ring with the Phillies will be the last of his career as a starter. If he wanted security, he sure got it. He knows where he’ll be for the majority of the next decade, and he’s getting a whole heap of money for it. To be honest with you, he would have been great in a Boston uniform, but I wouldn’t want someone only interested in money and years to play for us. Especially not someone who would ever seriously consider both money and years with the Nationals. I mean, they’re the Nationals. Not only are they National League, they’re the worst in the National League; in fact, they’re the worst in the Major Leagues. But wait; it gets better. He says he’s been considering signing with the Nats since hiring Scott Boras as his agent last season. Let me get this straight: he hired Scott Boras to get him a deal with the Washington Nationals. That’s ridiculous. Why would you hire Scott Boras to cut a deal with the Nationals? Jayson Werth doesn’t need an agent to negotiate a deal with the Washington Nationals; Jayson Werth can walk up to the Washington Nationals, write down a year amount and a dollar amount on a piece of paper, hand it to whoever is spearheading the process, and receive a “yes” to everything in five seconds flat. He says he’s impressed with the Nats’ acquisition of young talent? Give me a break. Nobody expects all that young talent to stay there; as soon as they’re able, they’re writing one-way tickets into free agency and out of town. And then he went on this tangent in which he basically implied that he only signed with the Nationals because they assured him that they’d continue to acquire the talent necessary to compete and win, because that is very important to him. Oh, sure. If it’s that important to him, he would not have signed with the Nationals. So they present their future plans to him and he asks questions about the team. Great. Now let’s see the Nationals follow that plan, the young talent stay put, and Werth stay in shape long enough to merit his salary at the end of his contract. I don’t think so. We signed starter Brandon Duckworth to a minor league deal. He was part of the Billy Wagner trade. We are supposedly interested in reliever Matt Guerrier. Oh, and I fully expect Mike Cameron to morph into some sort of hitting specialist against lefties, being that many of the AL East’s elite pitchers are lefties and some of our middle bats struggled against lefties last season. The only potential hindrance to that expectation is playing time. Cameron has the potential to get rolling, but he can’t get rolling if he never gets going. The Spring Training schedule is out. We’re opening with an exhibition doubleheader with Boston College followed by Northeastern. March features competition with Minnesota, Atlanta, Philly, both New York teams, Florida, Baltimore, St. Louis, Tampa Bay, Pittsburgh, Detroit, Toronto, and Houston. On Saturday, Sox Pax and tickets for twenty-one games in April and May will go on sale. Get psyched. The Winter Meetings are starting on Monday, and they’re going to be very interesting. And by interesting I also mean hectic, since most of the important offseason deadlines have moved up. Theo has his work cut out for him; we have a bat to replace V-Mart, but we’ll need another, preferably a righty, to replace Beltre since he’ll sign elsewhere, and relievers. Good ones. We’ve already made a splash; the key is to fill the club’s needs without removing all of our flexibility for next year. In other news, the Bruins dropped Sunday’s game to the Thrashers, 1-4. But then we shut out the Flyers, three-zip, and completely decimated the Lightning, 8-1. Krejci and Ryder each racked up three points. It was awesome. If this were baseball, that would be considered a slugfest. Then we lost in a shootout to the Leafs, but at least we get a point. The Pats take on the Jets tomorrow. Okay. Now Spring Training is really underway. And you know what that means: baseball. It’s pretty obvious, but when you actually reflect on the fact that live baseball is happening as we speak, it’s such a relief. The countdown to Opening Day continues: exactly four weeks. We can make it. Although, before I get into that, I’ll say this about Spring Training: it produces a lot of unnecessary worry when you focus on the scores. Keep in mind that Spring Training is experimentation central. Lineups get changed around, starters become relievers, relievers become starters, and starters rarely stay in for more than half the game. The score means a lot less than the story behind it. Take, for example, our game against Minnesota on Thursday, during which Beckett made his debut. We won, 2-1. Am I going to worry because we didn’t clobber them like we should have? Absolutely not, because it’s Spring Training. I’m more interested in how sharp Beckett looked, how many pitches he threw, whether he was comfortable on the mound, and how well he accomplished his goal of keeping his fastball down in the zone. And now, without further ado: on Wednesday, we saw Bonser and Kelly in the college double-header, which we obviously swept. Kelly threw ten pitches against Northeastern, seven of which were strikes. Two of his outs were Ks on changeups. By the way, he’s only twenty years old. Bonser threw a nine-pitch inning and got the win over Boston College. Not bad, considering he didn’t set foot on a mound once last year. We kicked off Grapefruit ball on Thursday against Minnesota, as I said. Beckett pitched two frames, allowed two hits and one run, and struck out one. Nineteen of his twenty-seven pitches were strikes. He did indeed his fastball down, and if he continues to do that successfully, our infield is going to have its work cut out for it, with the difference between last season and this season being that now it can handle it. Scutaro especially was ranging and flashing some nice leather. It’s so good to have a solid defensive shortstop again. Paps enjoyed a one-two-three inning; hopefully that’s an indication of what’s to come. Friday’s performance against Minnesota wasn’t great. Jon Lester’s first five batters singled, walked, walked, doubled, and singled, in that order. Yeah. Not the way you want to start Spring Training. He couldn’t even stay in the game to repair the damage because he’d thrown thirty-three pitches. Wake, on the other hand, coasted through two innings of two-hit ball; sixteen of his twenty-two pitches were strikes. He looks ready to go. And yesterday, we had the debut we’d all been waiting for. 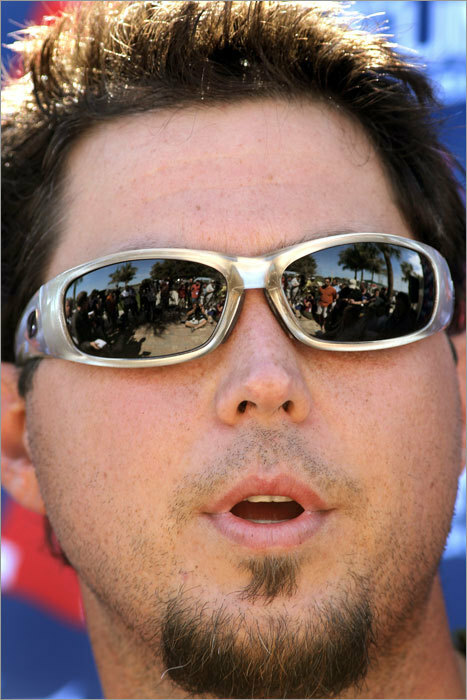 John Lackey, ladies and gentlemen! Six Twins stepped up, and six Twins went down in just twenty pitches. He was fast, he was sharp, and he was on. No mercy. This is going to be a sweet season. And let’s give some points to DeMarlo Hale, our new bench coach, for managing that victory while Tito was managing the away squad in Port Charlotte. Mike Cameron was injured this week. Adrian Gonzalez wants $180 million for eight years. Why does that sound so familiar. A great week, I’d say. We’ve seen promising performances from all but one of our starters, and I’m not worried about that one. It’s very early yet, but the future of the 2010 season looks bright. And that’s what Spring Training is all about, isn’t it? Optimistic speculation. We’re going to have some fun this year. Don’t look now, but the Bruins have won five of their last six. (That loss was a contest with the Habs that ended in a score of 4-1. I’d rather not talk about it.) And we’ve got a subpar schedule coming up; our next six games are on the road. The coming weeks are going to be crucial. Our sixty-nine points have seeded us seventh in the conference, a mere point behind the Habs. We need to make sure we stay in the top eight; otherwise, our season is done in the middle of next month. Happy Truck Day, everybody! 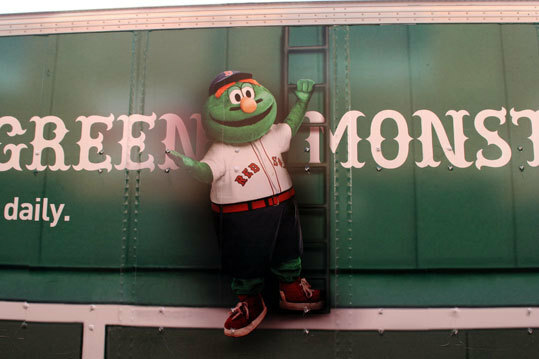 I’m telling you, nothing warms the soul like an eighteen-wheeler pulling out of Fenway Park to head south in the dead of winter. It’s been an especially long winter this year, so I’m ready to see some ball. I can’t even begin to describe how psyched I am. I don’t care how cold it is outside; Spring Training is almost here! Pitchers and catchers on Thursday! Life is good. Life, indeed, is good. Non-roster invitees are right-handers Randor Bierd, Fernando Cabrera, Casey Kelly, Adam Mills, Edwin Moreno, Joe Nelson, Jorge Sosa, and Kyle Weiland; southpaws Kris Johnson and Brian Shouse; catchers Luis Exposito and Gustavo Molina; infielders Lars Anderson, Yamaico Navarro, Angel Sanchez, and Gil Velazquez; and outfielders Zach Daeges, Ryan Kalish, Che-Hsuan Lin, and Darnell McDonald. Keep your eye on Casey Kelly and Jose Iglesias. They’re beasts. And I hope Lars Anderson doesn’t disappoint; he’s supposed to be the first homegrown power hitter we’ve had in a long time, and I’m psyched to see him put up some big numbers this year. Youk, Pap, Lester, and Delcarmen are already down there, which is a good sign. Pap and Delcarmen could really use the extra training after the badness they exhibited last season. Youk has stated his intention to spend the entirety of his career in Boston and retire as a member of the Red Sox. He stays in Boston during the offseason and loves New England. Way to be, dude. Way to be. And Lester will probably be our Number One starter. Last season he proved to be way more consistent than Beckett, and don’t look now, but he’s basically turned into one of the best southpaws in all of baseball. By the way, it’s pretty much official that we’re not resigning Rocco Baldelli. Guess who’s going to hit for Drew against southpaws: Bill Hall. This should be mighty interesting. Congratulations to Clay Buchholz, who’s been named the Dana Farber Cancer Institute and Jimmy Fund’s Rally Against Cancer Spokesplayer! Nomar made his debut as an analyst on Baseball Tonight and was absolutely horrible. He said nothing of consequence and made no sense half the time. I guess that means he won’t be retiring as soon as we thought. Spring Training. Baseball season. Almost here. What more can I say? Soon it’ll be Opening Day (and by that I mean Opening Night; thanks again, ESPN), and we’ll get this show on the road! In other news, the Saints won their first Super Bowl in franchise history last weekend. The final score was 31-17, and let’s not to forget to mention Peyton Manning’s single interception, nabbed by Tracy Porter for a seventy-four-yard touchdown. Tracy Porter now has the two most important interceptions in franchise history. Also, let’s not forget to mention the Peyton face. Oh, how the mighty have fallen. Boston College won the Beanpot. I know; I was surprised, too, because I was expecting the U after the B, not the C after the B. The final score was 4-3; it was a close game, and a good one, too. Oh yeah, and the Bruins are actually on a winning streak. You read right. We’ve won our last four games; a 3-0 shutout against the Habs last weekend, a 3-2 shootout victory against the Sabres, a 5-4 defeat of the Lightning, and a 3-2 shootout win against the Panthers. With the exception of the Habs win, which by the way was exceptionally gratifying, those were some seriously close calls, but we are in absolutely no position to be picky. A win is a win, and I’ll most definitely take it.